In the video we will approach this subject with four hands-on experiments. What can the observations tell us which can be comprehended by everyone who is moving his hands above and inside the Gu opening? I considered how these observations could be illustrated and came up with the following representation. The blue mushroom-shaped cloud in the figure I call the Gu field. The Gu field is an invisible part of the Hang Gudu which is located partly outside of the instrument. The Gu field describes a space above and inside the Hang Gudu which is sensitive for pitch change. 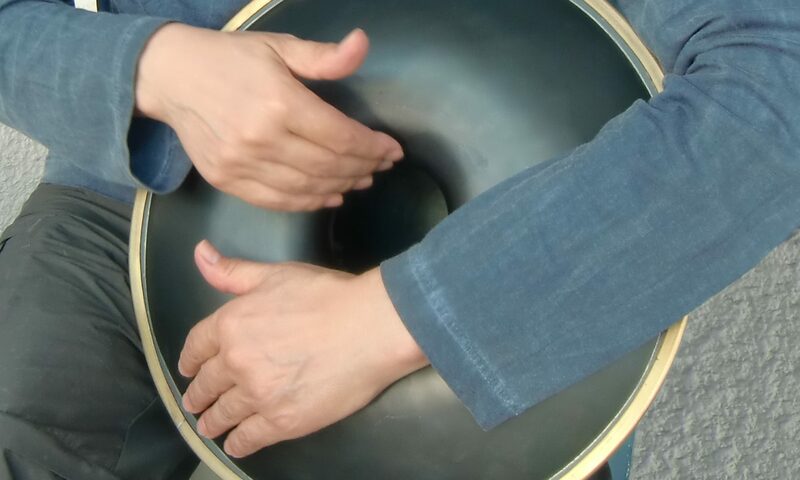 The intensity of the blue colour shows how strong the instrument responds with a pitch change, when the player’s hand is changing its position at this point. In order to play two adjacent tones of a scale we need very small hand movements in the center of the Gu field (the dark blue area in the figure). 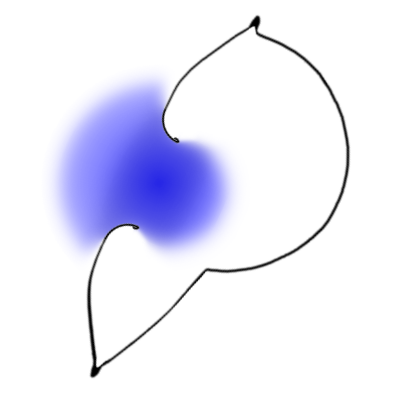 The more we move away from the center the bigger the needed movements are. In a certain distance hand movements no longer affect the pitch. The Hang Gudu does not only consist of the vessel enclosed by the Pang sheet metal. The Gu field is also an invisible part of the instrument located partly outside of the vessel. This should make immediate sense for those who feel the vibration of the air on the palm of their hand when it is slowly submerged into the Gu field. A lot is happening in this air space above the instrument. And as our hands are always located in or nearby the Gu field when playing the Hang Gudu, each gesture or position change can affect the pitch. thank you for taking the time to do this videos. we communicated in the past per mail, and you explained me the basics of how the hang gudu should be played. now, this series of videos are really helpful to see how it in practice. i m looking forward to see more from your discoveries. i do have question regarding recording ( excuse me if its not the right place to ask for it ), wich microphone do you recommend, wich angle and distance should the microphone be placed ? Hi J, as I don’t want to struggle with recording technique and adjustments of the devices, I looked for an easy to handle recorder with a good sound system and found the Zoom Q4 video recorder. With this device I have only to push the recording button and it will make recordings (video and audio) good enough for my purposes. i have a zoom h4n, and the quality is ok.
if any hang gudu / hang urgu / gubal player have some tips about microphones, i ll apreciate. Thank you for the series of vids about the gudu, it’s delighfully enlightening. Are you willing to do some similar videos concerning the Hang Urgu? Because I barely see any videos satring the urgu, although I’d like to hear what it sounds like solo, and specially how it compares with the gudu and the gubal. In case you don’t intend on shooting any videos about it, could you email me and tell me your impressions? Thank you very much. Do you own a Hang Urgu? A lot of insights on the Hang Gudu are valid also for the Hang Urgu. The main difference is that the Hang Urgu’s bass pulse is one octave below the Hang Gudu’s bass pulse. Therefore it is easier to learn playing the Hang Gudu and to understand how it works. There is also more melodic agility in the Hang Gudu’s bass pulse compared with the Hang Urgu. So they have different musical functions in the ensemble. My experience is that I learned a lot from Hang Gudu playing that I then could easily transfer to the Hang Urgu and Gubal. I had a Gubal long before I had the Hang Gudu, but I would say only after I learned to play the Hang Gudu I was realy able to understand and play the Gubal’s bass pulse. If you have any Urgu related questions, don’t hesitate to ask them here. I think it is worth for all readers. By now I’m not planning to make special Urgu videos. But perhaps, if questions raise, it will make sense to demonstrate things also in a video. I think you can see a lot of paralels with the Hang Gudu when you compare these videos with my demonstrations on the Hang Gudu. There is a difference between Urgu and Gudu: The tones of the Ringding are more present in Urgu playing than in Gudu playing. The Ringding is a subject I haven’t dealt with in this blog by now. But I will do later. Hi, Michael! It’s me again. Thanks for answering. I do not own an Urgu, but it’s a possibility for the near future. At the moment, I only own a RAV Vast, but I’ve been following panart’s novelties for a while, and the Gudu-Urgu scene has caught my attention the most. However, there’s not much information out there about these instruments and their potencialities, unfortunately. So, You’re doing a great, much needed job with your videos. Good luck!